After years of petitioning and planning, it looks like Wolftrap Elementary will finally be getting some long-requested sidewalk upgrades. The school was included on a list of transportation alternatives project submissions from the county to receive state grants. 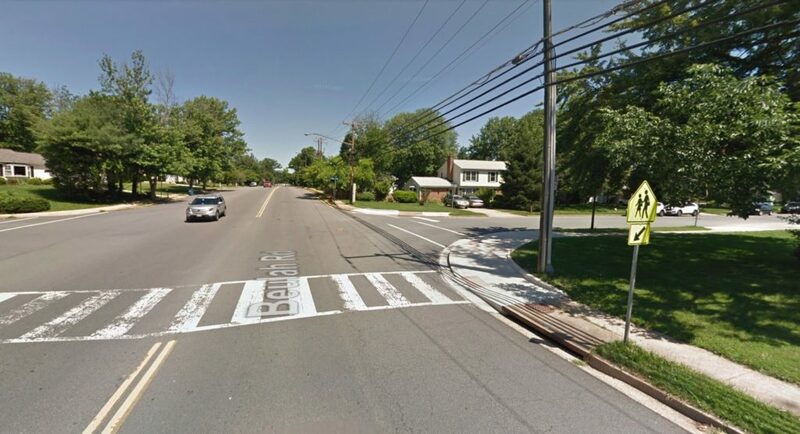 The Wolftrap Elementary School Crosswalk Improvement Project was awarded a $200,000 grant, with a local cash match of $50,000 approved at yesterday’s (Tuesday) Board of Supervisors meeting. The extreme width of the roadway encourages illegal passing of vehicles stopped for children in the crosswalk, whether manned by the School Crossing Guard or not. The project consists of 7-foot to 15-foot bump outs and an 8-foot median refuge for the crosswalk (including evaluation for potential pedestrian beacon device), and creation of a channelized southbound right turn lane, on-road bike lanes, and transitional median striping as road diet treatments. Wolftrap Elementary is at the heart of the residential network between Vienna and its namesake Wolf Trap National Park to the north, but despite this prime location for walkability, the school can be a challenge. There is currently only one crosswalk to the school across the busy Beulah Road and only one narrow, cracked sidewalk. The other side of the road drops off into a ditch or undergrowth. According to the school’s Parent-Teacher Association website, traffic on Beulah Road has increased over the last few years as GPS applications have increasingly directed drivers onto the once-quiet street into a shortcut from the Dulles Toll Road to Route 123 as part of an unofficial mini-beltway around Tysons. As county staff stated in their report, the PTA website indicates local parents witnessed the same issue. The PTA website also indicated that cars frequently speed around the site, empowered by unclear speed limit signage. The PTA said the heavy traffic and unsafe crossing conditions currently confines traffic across the intersection to the few hours where it is monitored by a crossing guard. Under the agreement, the county will manage the construction and maintenance of the improvements.